Pete the Cat and His Four Groovy Buttons is one of our very favorite books so we had to choose it for this month’s Virtual Book Club for Kids. The fun and colorful story by Eric Litwin is beloved by preschoolers everywhere for good reason–it’s just plain cool! The groovy repetitive text and Pete’s great attitude about life make it a story your kids will want to read again and again. 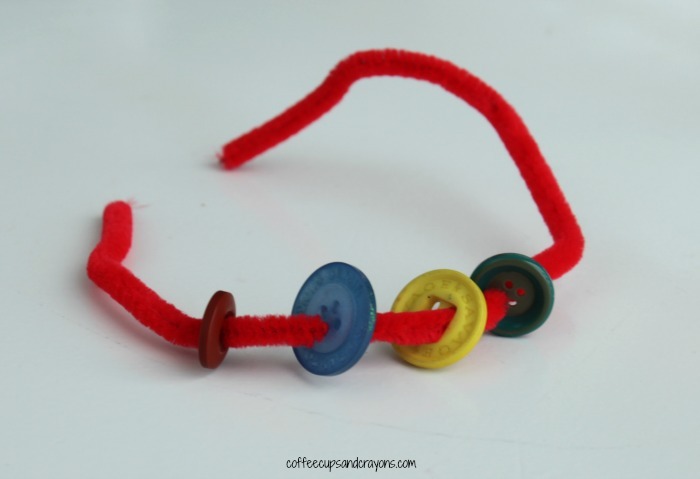 Then when you’re done reading you can sit down and make a Four Groovy Button Bracelet! We have a big bag of buttons in our craft supplies that we raided for this project. My preschooler decided to use a yellow instead of two blues and since it is her groovy button bracelet that’s what we went with. You can let your kids decide what color they want their buttons and paint them if necessary. Some of our button holes were tiny so my preschooler found it easiest to use a pipe cleaner to thread the buttons, but yarn or string would work too. Especially if you have a kid safe needle. Twist the ends of the pipe cleaner together and wear your groovy button bracelet! Free Printable Math Game Pete the Cat Inspired from Crystal and Co. Simple yet beautiful. That’s creativity!